The San Diego finished the day with 221 California Yellowtail. 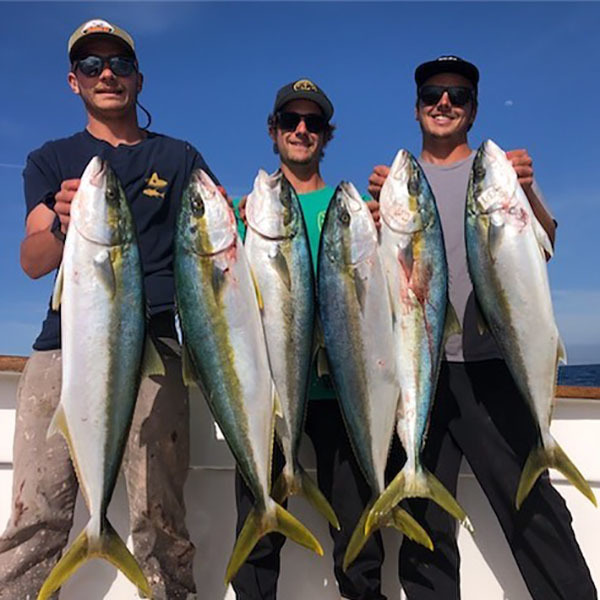 Coronado Island Yellowtail fishing is still going strong! The San Diego Full day trips are a definite run every day this upcoming week and depart at 5:30am. A valid passport or passport card is required for all passengers. The Tribute returned from their 1.5 Day Trip this morning with 37 Bluefin Tuna for their 29 anglers. There was one 160 pound fish, and the rest were in the 40-50 pound range. The fish were caught mostly on fly-lined live bait. The Pride put 9 Bluefin Tuna and 21 California Yellowtail on the boat for their 11 1.5 Day anglers. We have a couple of trips headed back out to look for Bluefin Tuna later in the week, so make your reservations now. It's Bluefin Tuna for your Easter meal! • Bluefin, Yellowtail and more!